On 4th of March 2018 former Russian double agent Sergei Skripal and his daughter Yulia were discovered on a park bench in Salisbury England in a distressed state. They were treated by passers-by, including a doctor, before being taken to Salisbury General Hospital. It was not the first or last time that the official story about what happened to the Skripals was changed. Three days after the Skripals were found, the British government issued a “D” Notice. The ‘Notice”, officially a “request” but in effect a demand, forbade mention of Mr Skripal’s friend Pablo Miller. Why publicity about Mr Miller was to be suppressed is one of the features of this case, and apart from the initial report in the UK newspaper the Daily Telegraph, which led to the ‘D’ Notice, he has not been referred to again in the mainstream media. On 12 March 2018 the British Prime Minister Theresa May made her first statement to the House of Commons in which she alleged that the Skripals had been poisoned with a nerve agent “of a type developed by Russia,” and that it was “highly likely ”Russia was responsible. 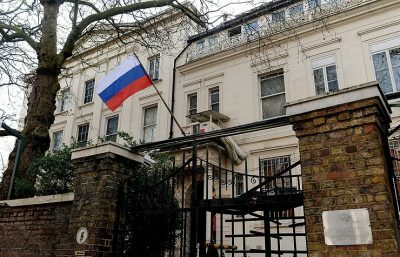 The British government subsequently circulated a memorandum and power point presentation to 80 embassies setting out the argument that Russia was responsible for what happened to the Skripals, and seeking support for their intention to expel Russian diplomats as a punishment. The various allegations made in the PowerPoint presentation were at best contentious and some were demonstrably untrue. It is suffice for present purposes however to focus only on the claims of alleged Russian responsibility for the Skripal attacks. A number of countries, including Australia, acceeded to the British demand and expelled diplomats. The statement made by Prime Minister Malcolm Turnbull announcing that two Russian diplomats would be expelled made no attempt to establish the truth of the matter or indicate any desire to do so. His statement simply echoed the allegations made in the British document. Turnbull said that the use of a chemical weapon to try to murder Sergei and Yulia Skripal reflected a “pattern of recklessness and aggression” by the Russian government that had to be stopped. Russia, he said was threatening no less than “the democratic world” in deliberately undermining the international rules based order. He went on to list a series of other alleged transgressions that echoed the claims made by the United Kingdom government. One of the interesting features of this case is that not only was it a rush to judgement before the evidence could possibly have been gathered and analysed, but that the mainstream media and the politicians have not deviated from their initial claims, despite the wealth of evidence that has subsequently emerged. Like the Red Queen in Alice in Wonderland, they demanded the sentence before the evidence had been presented, and also like Alice in the eponymous story, asked us to believe six impossible things before breakfast. The diligent reader is able to readily ascertain just how lengthy that list of impossible things is. It is suffice for present purposes to mention only a few to demonstrate that the United Kingdom’s entire story is a fabrication that would be funny were its potential consequences not so serious. The United Kingdom government claimed that the Skripals had been poisoned by “a military grade nerve agent” that they see it was a Novichok “of a type of developed by Russia.” From that combination of alleged facts, we were expected to infer that only the Russians could have been responsible. ”Novichok” is a sufficiently Russian sounding nomenclature to give superficial credence to at least part of the claim. The first difficulty however is that there is no “Novichok” nerve agent. The term simply refers to a class of organophosphate chemical weapons. It is true that this class of chemical weapon was developed in the former Soviet Union, as described in a book published by a former employee of the chemical centre, readily available on Amazon. That manufacturing and research development centre was demolished pursuant to the Chemical Weapons Convention in 1999, as was described as the time in an article in the New York Times. Material from the demolition process was taken back to the United States. All of this information is readily available and politicians and journalists prior to their making claims about nerve agents “of a type developed by Russia” should have known it. The Novichok class of nerve agents may or may not have been initially developed by the Soviet Union, but that is a far cry from linking the substance allegedly used in Salisbury with that original program. A number of European governments have acknowledged that they possess the Novichok class of nerve agents. A search of the United States Patent Office records however, reveals that between 2002 and November 2017 81 patents were applied for using the name “Novichok”. A patent filed in April 2013 includes a description of a delivery method, including bullet like projectiles that can target a single person. In contradistinction to unsubstantiated claims that as many as 40 people had been affected, Dr Davies referred to only three patients receiving treatment in this context. This was presumably a reference to the two Skripals and a police officer. A234 is a highly toxic substance, 8 to 10 times more powerful then VX (of a type developed by the UK) that had been used to kill a relative of North Korean leader Kim at the Kuala Lumpur airport. VX will kill within a few minutes, yet the A234 allegedly used on the Skripals failed to kill or even severely disable them or the third alleged victim, detective Sergeant Bailey. A further and likely conclusive reason to reject A234 as the substance used, was that the report by the OPCW based on samples collected from Salisbury 17 to 18 days after the incident said that the substance in the samples was of “high purity”. The scientific evidence, again readily ascertainable by a reasonably diligent journalist is that A234 and similar substances degrade rapidly. It is literally impossible for samples collected 17 to 18 days after the event to be of “high purity.” The purity also makes it impossible to identify the specific source of the manufacture, and furthermore guarantees that it originated in a properly equipped laboratory. That OPCW report effectively destroyed the last shreds of the UK government’s claims. Given that Bailey and the Skripals have both made complete recoveries, it could not have been a “military grade” nerve agent that caused their plight. There is also the indisputable fact that whatever was used on the Skripals could not have come from Yulia’s suitcase, the air vents of their motor vehicle, or the front door knob of Mr Skripal’s house, or any of the other fantastical claims made at various times by the UK government for the simple reason that they were alive and well approximately six hours after leaving the house. During that time the Skripals visited the cemetery, had a meal at Zizzi’s restaurant, and had an untroubled walk through the centre of Salisbury, captured by the CCTV camera. The fact that they both took ill, at the same time and in the same specific location, leads to the almost irresistible inference that they were attacked at or near the park bench where they were found in a distressed state. For these various reasons, and a great deal of the others in the now considerable body of literature on this topic, we do not know with what they were attacked, nor by whom. At best we know approximately where and at approximately what time. A proper inquiry, as opposed to the wild and unjustified accusations and premature conclusions constantly reiterated in the mainstream media, would approach this question with an open mind. It has been abundantly clear that a proper enquiry is the furthest thing from the minds of the British government or their acolytes such as Australia. A proper inquiry would also consider the relevance of motive. There has been no plausible suggestion, much less evidence, as to why the Russian government would wish to do the Skripals harm, and some solid reasons why the Russian government would be the least likely candidate to wish ill upon the Skripals. This brings us back to Sergei Skripal, his history and the aforementioned D notices. One of those D notices inhibited publication of the details relating to Pablo Miller. That raises the obvious question, not pursued by the mainstream media unfettered by the D notice, as to why the British government would wish to protect Mr Miller’s identity and his links to Mr Skripal. Miller worked in Moscow in conjunction with Christopher Steele, the assumed author of the infamous Trump dossier that collected together various allegations about Trump’s Russian activities, both business and personal. That dossier was commissioned by the Democratic National Committee on behalf of Trump’s opponent in the 2016 presidential election, Hilary Clinton. The DNC commissioned Fusion GPS who in turn contracted with Orbis Business Intelligence. Christopher Steele was the principal of Orbis and Miller was one of his associates. The American outlet Buzzfeed released the complete dossier on 10 January 2017 and on the same day the May government issued a D notice prohibiting the British press from revealing Steele to be the author. The Wall Street Journal however, published his name the following day. According to the Czech magazine Respekt, Skripal had recent links to Czech intelligence and he travelled to both the Czech Republic and Estonia in 2016 and had met with intelligence officers from both countries. This evidence strongly supports the inference that Skripal was still an active agent on behalf of the British who were known to be strongly opposed to the election of Donald Trump. Given Skripal’s knowledge of Russian intelligence, his links with the intelligence community in at least four countries, his close ties to both Miller and Steele going back to his GRU days, and at least according to one textual analysis of the dossier, it is entirely possible that Skripal was in fact one of the authors of the dossier. These facts are now well established. At the very least it raises serious questions about who else might have a motive to give Mr Skripal a “message.” Whoever was responsible, the incident was certainly used by the UK government as part of a wider campaign to discredit the Russian government in general and President Putin in particular. In this endeavour, they have been willingly aided and abetted by the Australian government and mainstream media. The failure of either to acknowledge the manifold flaws in the original allegations and to accept that the UK government’s version has been comprehensively discredited is an enduring disgrace. At the very least the Russian government is owed an apology. That would go at least some way to acknowledging that the premature judgement and intemperate response has damaged Australia’s international image and its foreign relations.